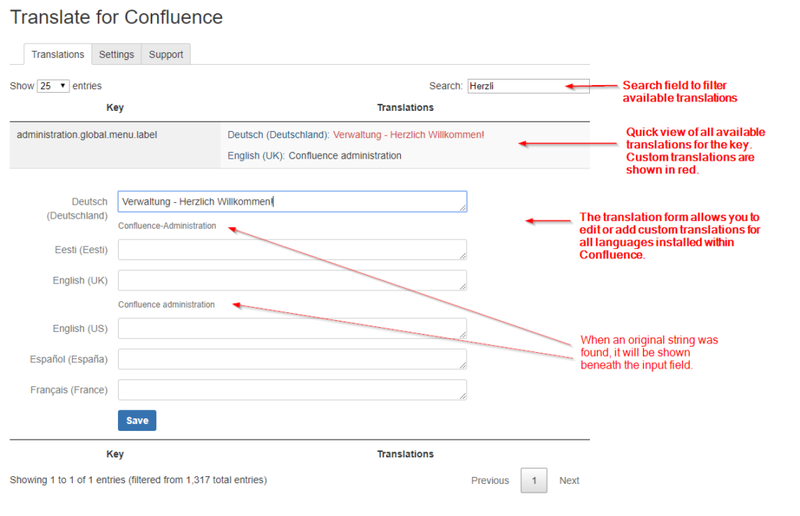 Install the Trans­la­te for Confluence add-on direc­t­ly from the Atlassian Mar­ket­place. Read more about instal­ling an add-on. First you have to enab­le the collec­tion of avail­ab­le trans­la­ti­ons. It is pos­si­ble to set users as trans­la­tors. The­se users will be able to edit trans­la­ti­ons. All known trans­la­ti­ons are shown on the “Trans­la­ti­ons” sec­tion of the set­tings page. Click the row, edit your trans­la­ti­on, save. That’s it. The Add-On will auto­ma­ti­cal­ly app­ly availa­be trans­la­ti­ons. So you don’t need to do anything. No, this is cur­r­ent­ly not pos­si­ble. But on our road­map though. A specific text is not found, what can be the reason? Collec­ting trans­la­ti­ons might be dis­ab­led. Try enab­ling it and rel­oa­ding the spe­ci­fic page. Or, that text was “hard­coded” and not using the inter­nal loca­li­za­ti­on pro­ces­sor. If this is a text direc­t­ly from Atlassian you may ask Atlassian sup­port for this, if this is a text from a spe­ci­fic add-on, you may ask the add-ons ven­dor.